Arthritis is a common condition that causes pain and inflammation of the joints and tissues around them. The symptoms of ankylosing spondylitis can vary, but most people experience back pain and stiffness. The condition can be severe, with around 1 in 10 people at risk of long-term disability. The spine is made up of a column of interlocking bones called vertebrae. The vertebrae are supported by muscles and ligaments that control the movements of the spine. In ankylosing spondylitis, the spinal joints and ligaments and the sacroiliac joints (the joints at the base of the spine) become inflamed. Inflammation in the spine can cause pain and stiffness in the neck and back. Sacroiliitis (inflammation of the sacroiliac joints) causes pain in the lower back and buttocks. Ankylosing spondylitis can develop at any time from the teenage years onwards. It is three times more common in men than in women. The condition usually occurs between 15 and 35 years of age, and rarely starts in old age. Estimates of different European populations suggest that ankylosing spondylitis may affect between 2-5 adults in every 1,000. 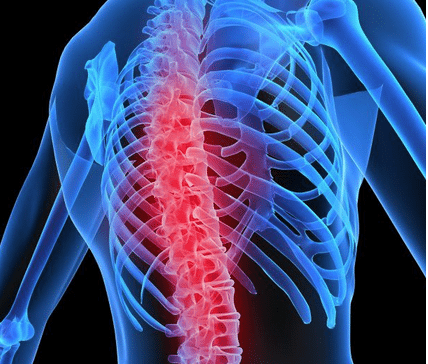 In the UK, around 200,000 people have been diagnosed with ankylosing spondylitis. The progression of ankylosing spondylitis varies among people. It is estimated that 70-90% of people will remain independent and only minimally disabled by the condition. After around 10 years the inflammation may make the neck and back rigid. This process is called ankylosis. In some people who have severe, long-standing ankylosis, their rib cage can also become stiff and inflexible.